I'm back...and I have more photos of delicious breads! This week we moved in to complex breads, with starters and sponges and poolishes. What this means, is that a portion of the dough is prepared a day, a few days or even a week in advance, and left to rest and develop flavors, before being used in a recipe. The most common of these is a sourdough starter, but there are in fact many types. First up - Multigrain bread! 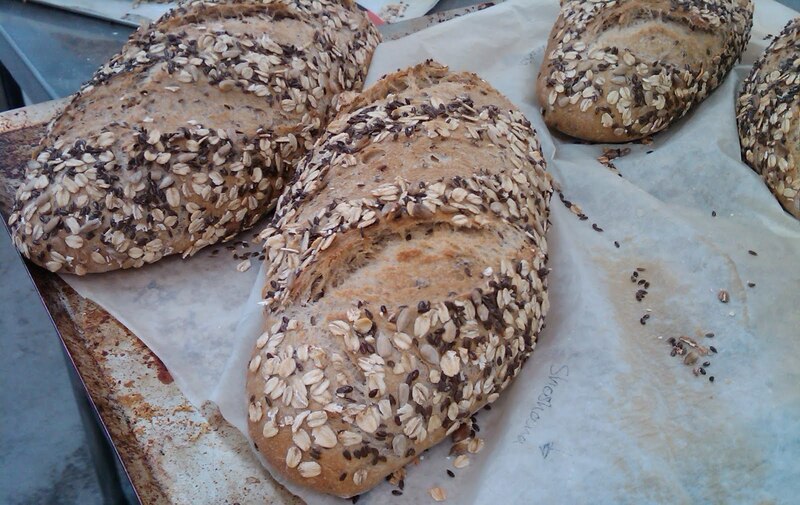 This bread is filled with wonderfully healthy things like oats, flax and sunflower seeds. This recipe was made with what's called "pate fermente" or old dough, which is just how it sounds - a piece of dough left for 24 hours. Next up is a fougasse - a traditional French flatbread, similar to focaccia, cut to resemble a leaf shape. It is brushed with a light coat of olive oil and sprinkled with sea salt, and is crispy and chewy and delicious. This here is a white sourdough loaf, The sourdough is a starter made of flour and water that is left to develop for at least a week before use, for extra complex flavors. This beauty is a crown made of rye sourdough rolls, filled with sunflower seeds and topped with some decorative oats, flax and sunflower seeds. We made two sourdoughs, one with white bread flour, used in recipes like the loaf above, and one with rye flour, used here. These are more rye sourdough rolls, that are a little denser and richer, and filled with the oat-flax-sunflower seed mix instead of just straight sunflower seeds. It should be noted that no rye breads or rolls are actually 100% rye flour, but really a mix of rye and bread flours. All rye would be inedible. This is a loaf of whole wheat sourdough, shaped in to a cylinder shape. In case you were wondering, a slice of this, fresh out of the oven, with a touch of butter on it, is basically heaven. Also, lunch. Not pictured: rosemary bread - which I actually have a loaf of in my freezer but have yet to try, olive bread - which I did not eat because I hate olives and pita bread - which I devoured too quickly to photograph. Yep, I've been busy! I promise, I will share some bread recipes soon - just wanted to share these delicious photos first. Sometimes I wish I could attend pastry school (specially when I see posts like this). I thank my lucky stars for the diagnostic medical sonography schools I attend, though.